NOTE: The format of this type of horror title is better experienced by the reader. Therefore, specific details of the principle tale have been withheld from the below review. Instead, a thematic overview has been provided. As a fan of old-school EC horror stories, I was pleasantly surprised to walk into my local comic shop on Wednesday afternoon and learn that IDW has taken a crack at the horror genre with their new title, Diablo House. My anticipation was furthered when I learned that renown Spanish horror artist Santiperez was involved. So, on a whim and with levied expectations, I picked it up along with the more traditional fare which inhabits my pull box and boy, am I glad I did. The first entry into what is intended to be a short-story-based bi-monthly title begins by introducing the reader to Riley, a suspiciously tattooed beach bum through whom the story is narrated. And, of course, his place of employment and the titular Diablo House. Both of which reside in the real-world neighborhood of La Jolla, CA just north of San Diego. The use of which was perfect; in that it grounds the story in the reality and adds depth to the locale. A great deal of mystery is apparent early on; with the first several pages following Riley as he takes the reader along a brief tour of this modern day house of horror, who’s true nature is not fully realized until the conclusion of Riley’s inaugural tale. That being, one of greed, betrayal, envy, lust, and ultimately, suffrage. Which is very well executed by Adams, who provides a refreshingly morbid tale with an unexpected twist that is made more impactful due to its context. Please note, this is not the work of Edgar Allen Poe. But it is a strong opening tale which clearly outlines the intent of the creative team. That being, to highlight both Riley and his dark palace of pain as the principle characters in an intended on-going series which will explore the essence of sin itself. In fact, its format is strikingly similar to that of ECs Tales from the Crypt, which is not really a bad thing. From a technical aspect, Diablo House is solid. The story is concise, intriguing and introduces relatable prototypical characters whom serve to drive home the theme. Both plot and pacing feel balanced and the sequence of events are fluid. The artwork is expertly crafted and, as stated before, harken to pre-comics code horror titles. Better still, Santiperez’ lines and shadows are distinctly modern and provide much greater detail and expression than his predecessors. Additionally, Fotos’ color work is distinct and his blending and shading is seamless, giving an almost watercolor feel to the book and taking advantage of the paper’s matted finish to retain a “dry brush” look. Lastly, the lettering provided by Robbins is well suited for the book’s narrative style and cleverly uses bold lettering within dialog to subtly emphasize the central theme of the story. 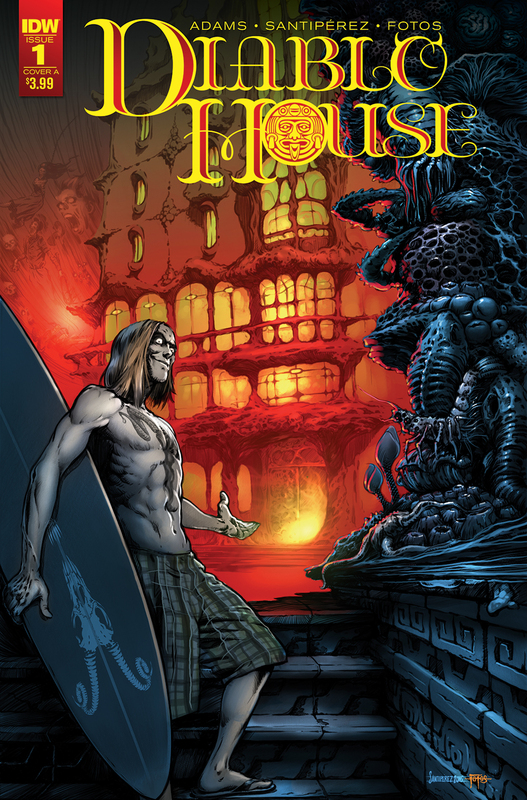 Diablo House is a great start to what could become this generation’s Tales from the Crypt. However, what made that title special was the publisher’s desire to push the boundaries of social commentary. If given the flexibility to do so, the creative team seems well suited for elevating this title to similar heights. Especially, considering our current socio-economic climate. I for one am interested in seeing where they go in issue #2 (Sep 17).